Apprx. 75 x 74 inches. 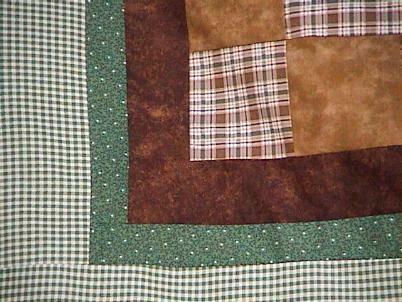 This is nice new Northwoods Pinelake, green, mottled brown, single irish chain quilt top that I made. The dark fabric is a pretty chocolate mottled brown. In the solid squares, you can do wonder quilting, or applique. This can be really beautiful with a little work and extra time. Make it an heirloom. Made with new 100% cotton HIGH quality Marcus Bros., Maywood, Spring Industries and other good quality fabrics.